The second round for the Philadelphia blog tournament known as The Phield kicks off today. Voting starts at 8am and goes through 8pm. The only things that stand between PhoulBallz.com and the Sweet 16 are your votes and the #3 seed Delaware News Journal's Philled In blog. Vote for all your favorite blogs by clicking THIS LINK. Voting is open 8am till 8pm. #1- Exclusive interviews. Philled In isn't the only one with press access. With over 50 interviews over the past year, PhoulBallz.com has brought readers an inside look at all the best known prospects such as Trevor May, Domonic Brown, Anthony Gose, BJ Rosenberg, Michael Taylor, Mike Stutes, Kyle Drabek and many more. In addition, readers have gotten Q&A's from Major League stars such as Pedro Martinez, JC Romero, Greg Dobbs, Clay Condrey and others too. To put it simply- PhoulBallz is like thong underwear....we're in there. #2- This image of Jayson Werth as The Human Torch, brought to you by PhoulBallz.com. It's hot! 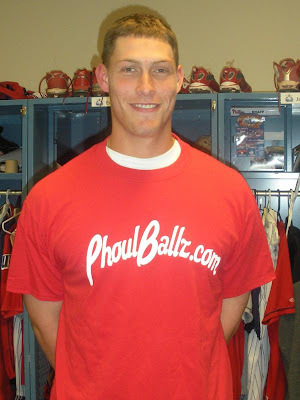 #3- Because former Phils pharm hand Jason Knapp and other Phillies minor leaguers wear PhoulBallz.com shirts. #4- The Sunday School History Lessons that PhoulBallz.com brings readers each week. The past is one of the most important things about the sport of baseball. The heritage, the nostalgia, the frame work....they're all aspects of baseball that make it so appealing and fascinating. Phans today should know about all the players, coaches and team personnel that have impacted the Phillies franchise over the years. Sunday School articles have featured lessons on Eppa Rixey, Tony Taylor, Jack Sanford, Johnny Callison and plenty more under-acknowledged stars of the past. There just aren't many blogs that place importance on history the way this site does. #5- PhoulBallz.com isn't exactly a prime news source, but the site has managed to deliver some breaking news....like the Phillies' misprint on Harry Kalas' Wall of Fame plaque and the brief, but comical, Brett Myers/Anthony Gose feud last season. #6- Because the other guy is new to the Phillies' beat and, like, most people don't really know him, or some junk. I mean, vote for your friendly neighborhood PhoulBallz, who has been here, steadily, for a good long while. The other guy is temporary. #8- Because PhoulBallz.com kept its name the same, despite many ladies nicknaming the site "Dirty Dishes" due to their deep desire to always do us right after dessert. #9- Because PhoulBallz.com brought you Jose Contreras' family tree. #10-Because if PhoulBallz.com advances to the Sweet 16 of The Phield, 16 readers will win prizes from the site. No diggity, fo' shiggity. **UPDATE** PhoulBallz.com was victorious in the 2nd round and has advanced into the SWEET 16 of The Phield tournament. Thanks so much for your support. The next round is Friday. You've got the GMs' support Mr. Ballz! Congrats on the victory! You got my vote!